"It’s like a fairy tale,” I say to my husband of half an hour. We are sitting, Champagne in hand, on a white-sand beach, gazing at the darkening sky above the Indian Ocean. The heavens are studded with stars and a trio of celestial bodies that have witnessed our marriage: Venus, planet of love; Jupiter, planet of luck, and Saturn, planet of karma. A falling star blazes across the sapphire sky, and we make a wish for our future; we are on the road together now. It is a perfect moment on a day that has been filled with them, but then, we are in the Seychelles, and perfect moments are a speciality here. When we decided to get married abroad, the tropical archipelago was the sole contender, not least because of the lack of red tape. 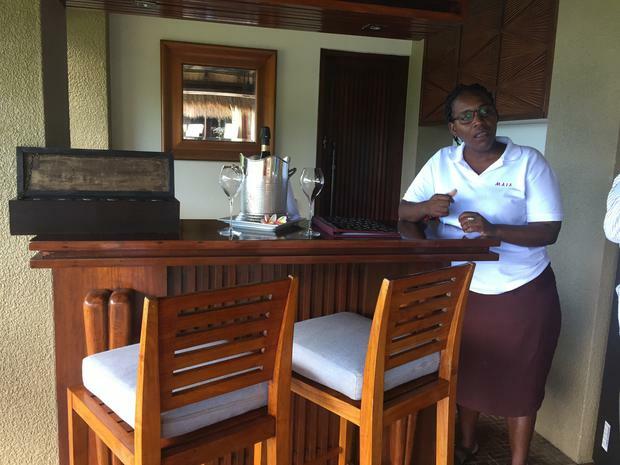 Maia Luxury Resort & Spa, on Mahe, the main island, was to be our venue, and our wedding planner, the resort’s stellar Vanessa Gertrude, organised everything, making it an utterly stress-free experience. When it comes to weddings, there are some things worth splurging on. Flights, for one. We flew with Turkish Airlines to Mahe, via Istanbul, and business class made all the difference, with our holiday beginning the moment we stepped on board. The airline has won many accolades for the calibre of its service, and from the moment the on-board chef hands you a welcome drink, to the delicious food — think smoked salmon, oven-warm bread — you are royally pampered. The gracious staff magically turn your seat into a fully flat bed, and John, who had never flown in style before, was gobsmacked by the luxury of it all, not to mention the variety of movies on offer, and the very moreish bags of roasted hazelnuts! Such was the level of in-flight comfort, we both slept soundly and were well rested on landing, which meant we could make the most of our first day. On the stopover in Istanbul, we made use of the incredible lounge (it’s exclusive to business class passengers); it’s one of the world’s biggest and best (I’m dying to see its equivalent at the new Istanbul Airport, which has just opened). There’s an array of food and drink, along with beds, a cinema, a pool table, massage chairs, and, the icing on the cake: fabulous showers. It’s a blessed oasis of calm. 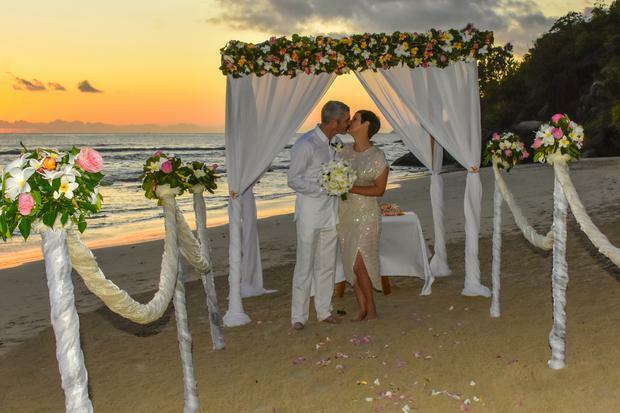 To get married in the Seychelles, you must be staying on the islands at least two days before the ceremony, so we topped and tailed our trip at the boutique CaranaBeach hotel, more of which anon. 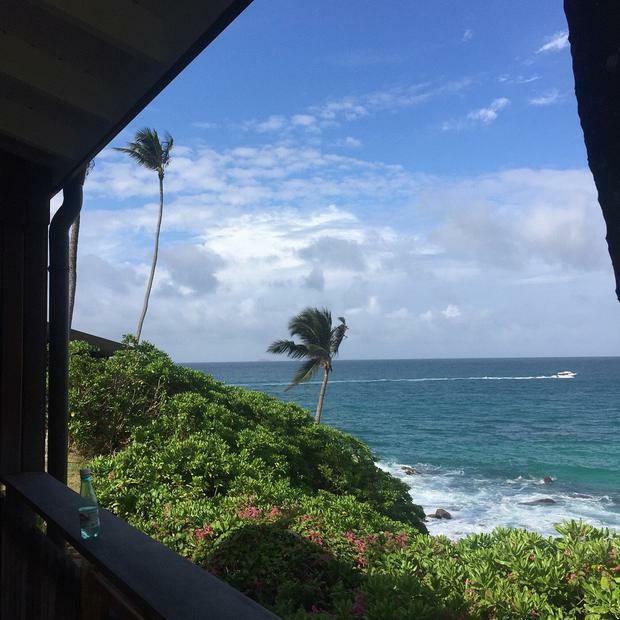 Our final nights as singletons were spent on Silhouette Island (named for Louis XV’s finance minister) the third largest island of the archipelago, and home to just one resort, the idyllic Hilton Seychelles Labriz Resort and Spa. The rest of the island is protected, and home to Giant Aldabra Tortoises, and other rare flora and fauna. Once we docked (the island is a 45-minute boat ride from Mahe) we were ferried straight to our love nest: a King Beachfront Villa, located just steps from the turquoise sea. At 101 square metres, it had a huge bedroom, a vast bathroom, an outdoor shower and a gorgeous sun deck. We wasted no time in taking our first dip in the warm waters, then set off to explore. The Seychelles were uninhabited until 1502, when Vasco de Gama spotted them, and were then largely used as a base for pirates, until they were claimed by France. The French established spice plantations on the islands, and the Dauban family, which owned Silhouette until 1960, cannily switched to producing copra and vanilla, which proved so profitable that it earned Auguste Dauban the moniker ‘the Rothschild of the Indian Ocean’. Our wanderings brought us to La Passe village, reputed to have been bought by the Daubans for the price of a violin; and Grande Case, the Daubans’ former home, now the resort’s Creole restaurant, and just one of the food options, which range from Japanese to Italian. There are endless opportunities for amusement, including tennis, boat trips, kayaking and a Padi diving centre — the coral reefs around Silhouette are abundant with marine life. We were more than up for a spot of pampering though, and made a beeline to the stunning Eforea Spa. Set into the massive granite boulders that characterise so much of the Seychelles (they are the world’s only oceanic islands of granitic rock; the younger outer islands are coralline), the spa’s rooms are open to the tropical air. We were pampered side by side, and finished our blissful visit in the infinity pool, watching the fruit bats flit, as the silvery moon set behind the takamaka trees. We dined that night in Portobello, the resort’s fine-dining Italian eatery, and finished our blissful day with margaritas at the beach bar — it’s worth noting that Hilton Labriz has banned plastic straws and bottles. My husband-to-be spent the next day hiking up the mountain, while I lazed on the beach, and we spent a brilliant evening at the beach watching Cocktail on the resort’s giant inflatable screen, while stuffing ourselves with superb sushi. The next day we headed back to Mahe, where our ever-smiling driver, Gilly, collected us from the jetty and whisked us across the island to Maia. Maia is truly special. The Balinese-style resort, which is set in 12 lush acres of hibiscus, lemongrass and cinnamon, is composed of a central building that houses a restaurant, bar and pool, and 30 thatched villas set into the hillside overlooking the idyllic Anse Louis beach. It’s the last word in all-inclusive luxury, and the staff really set Maia apart. To a person, those who work at Maia are a delight; they are warm, welcoming and truly wonderful. We were met at our Signature Villa, set high in the hills with the most incredible panoramic view, by Michelle — each villa has its own dedicated 24-hour butler, who can organise anything your heart might desire. We hardly had time to take the gorgeousness in — a huge infinity pool, an outdoor bath, a sumptuous marble bathroom with full-size Hermes toiletries, a kitchen, a lounge area and a huge canopied bed — when we were whisked to the spa for a couples massage to banish any pre-wedding nerves. And what a spa. The vast treatment rooms are open-air, while the highly-skilled Balinese therapists use luxurious Omorovicza products. Ayu and Newman massaged us side by side (something I could get used to!) with fragrant oils of our choosing, and sent us off floating on air. After a butter-soft wagu beef burger each at Tec Tec, it was time to get ready, as far below on the beach we could spot preparations being made for our sunset ceremony. Once dressed in our finery, Michelle handed me my bouquet, a stunning ball of frangipani, and summoned the wedding buggy to take us to the beach. We walked hand-in hand up the aisle — a gorgeous construct of white swags, topped with pink roses and frangipani — to where our witnesses, Lionel and Fabienne, the guest relations manager and front office manager, respectively, waited, along with the registrar, Marie Harray. The ceremony was made jolly and lovely by Marie, and our two gracious witnesses. Formalities over, we cut our gorgeous cake, while Lionel popped the Champagne, and left us to watch the setting sun and enjoy our first moments of married life. We arrived back to find bubbles on ice, a flower-filled outdoor bubble bath, and a rose-petal-strewn bedroom, decorated with towel swans, pink and white frangipani and glitter, all Michelle’s work. We disrobed and hopped in, toasting our marriage to the strains of the Flower Duet; all the villas come with a pre-programmed personalised soundtrack. And our perfect day wasn’t over yet. Down at the beach, a table had been prepared under the stars, and we enjoyed an incredible feast served by Michelle, who, by now, felt like an old friend. She was back to cook us breakfast in our villa, and as all the staff waved us off as we left, we had to pinch ourselves once more. Staying at Maia is like being sprinkled with fairy dust; every moment is perfection, and you feel very special indeed. Our next destination was Bird Island, a family-owned eco-resort paradise. My new husband could hardly contain his excitement, as it’s one of the few islands where it’s possible to fly fish. The fun began with the flight; the tiny De Havilland Twin Otter gave us an aerial view of Bird Island’s 1.5 million-strong sooty tern colony, which featured on Attenborough’s The Life of Birds. The island’s facilities are basic, but people don’t come for luxury, they come for the wildlife. Giant Aldabra Tortoises roam freely, and, as its name suggests, the island is home to countless species of exotic and rare birds. Bird has a real castaway vibe, and the ever-present birdsong provides a unique accompanying soundtrack. The island, which has won numerous environmental and eco awards, abounds with wild and marine life; we encountered hermit crabs, giant rays, moon jellyfish, red pea crabs, geckos, tenrecs, fruit bats, and more. John spent most of his waking hours neck-deep in the tropical waters, catching (and releasing) needlefish and wrasse. Before we left, I tossed the frangipani blooms from my bouquet into the ocean, and made another wish. We’d begun our Seychelles adventure at CaranaBeach, and were pleased to be ending it there. It’s a dream of a boutique hotel, with 40 chalets tucked into the cliffside overlooking a small but perfectly formed beach. It’s a perfect choice for honeymooners as it’s tranquil and has amazing food, with ingredients coming from its sister island’s organic farm. The hotel has many charms, not least its staff who couldn’t do enough for us, but we couldn’t get over the value. A glass of Champagne cost a mere 140SCR (about €9) so I had one (or maybe two!) every day, and, at the Sens Spa Marlinne’s massages were so good that we treated ourselves several times; it was an hour of bliss for SCR1,000 (about €64). We stayed in a pool villa, but the main pool was never crowded, with ample sunbeds which have giant pillows for ultra comfortable lolling about on. Our villa had a terrific view and was very private and well appointed, with a Nespresso machine, a massive bathroom and a huge sun terrace. Another amazing plus came on our last day, when for a small fee, a late check out was facilitated, which allowed us to spend the entire day sunbathing and making use of our private pool, rather than hanging around the airport for hours. Fairy tales may be out of fashion these days, but having experienced a real-life one (and married a prince) I have to say I highly recommend it, not least the happily ever after! Michelle, our butler, was amazing. She was there, as if by magic, when we needed her, and anticipated what we needed before we even knew that we needed it. She went above and beyond to make our wedding day truly special, and nothing was too much trouble — she even offered to unpack for us! It can cost up to €10,000 a week to fly-fish on other islands in the vicinity, but on Bird, it’s free; you just need to bring your own gear. 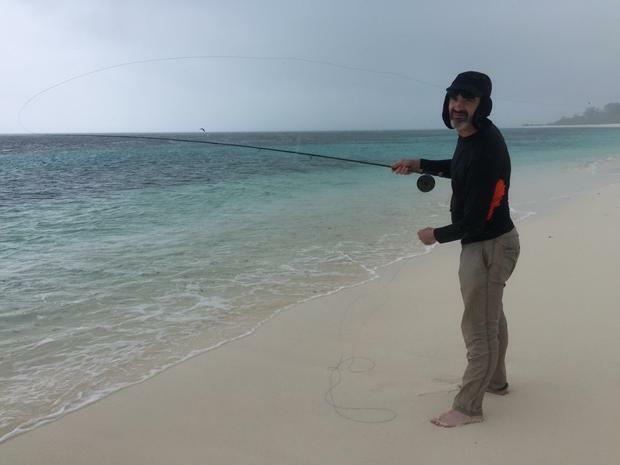 John had an epic tussle with a bonefish that ultimately outwitted him. He has already started saving for the return trip and rematch. Gemma flew Dublin-Istanbul-Seychelles with Turkish Airlines. Turkish Airlines have 14 flights weekly to Istanbul, and beyond Istanbul to 305 domestic and international flights. It was named best airline in Europe by Skytrax for six consecutive years; Turkish Airlines flies to more countries in the world than any other airline. Six honeymoon travel tips: Where do I start? What are the pitfalls?